There is an obvious resemblance between this example and the striated form of white calcite, or marble, known as aragonite (see Treasury 3, nos. 388 and 389), and this kind of glass may have been intended to imitate it. While the initial inspiration may have been provided by aragonite, this should not be taken to imply every glass bottle made of the same material was intended to imitate it. In this particular case, however, it probably was. The glass versions are as rare as their stone equivalents, and this is one of the most impressive. It resembles aragonite very closely, although with the typical slightly more emphatic striations of glass. Formally, this is a shape both simple and practical. A compressed ovoid, it tends towards the popular rounded-rectangular form so common in the snuff-bottle world. It might have been made at any time during the dynasty, a mid-Qing date being the most likely. It is blown, possibly into a mould, although there are no indications of one. Apart from concentric rings at the lip, a further indication of the blow iron is furnished by the small, roughly star-like mark in the centre of the foot (visible as much from the interior as from the exterior). Such a mark can occur in the process of blowing when, as the air is forced into the glass, striations stretch out from a single point opposite the blow iron. A similar effect, however, can be created by the use of a pontil, which is a metal tool bonded to the end of a hot glass vessel to facilitate manipulation. When this is twisted off, or cut from a vessel, it leaves a mark, usually in the centre of the foot. 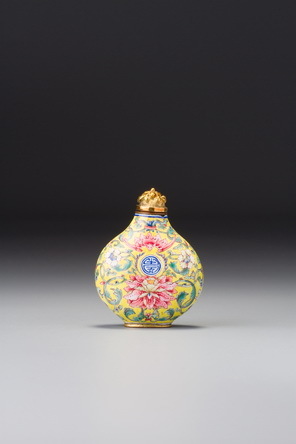 We believe that, as a rule, snuff bottles and possibly other Chinese forms were more commonly blown into moulds, where a pontil was not required. There are obvious pontil marks on some very early vessels made under the influence of the missionaries, but most later Chinese forms either did not use them or were so extensively finished by the lapidary that any signs of their use were obliterated.